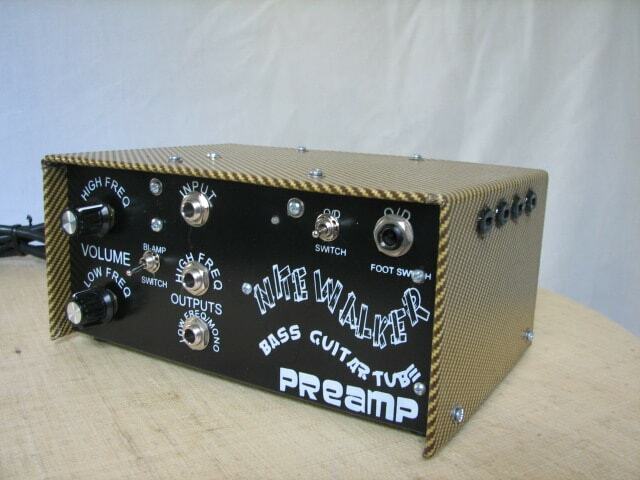 Nitewalker Bass Guitar Tube Preamp! Newbasstone, Inc’s. Nitewalker Bass Guitar Tube Preamp is a proven vital new idea for Bass Guitar Players wanting a richer tone – Low register and High, wanting real time solutions to troubling tonal choices. First of all it’s a unique remedy for the Bass Player Blues. Is your combo looking for a way to boost its’ ability to leverage technological tools to enhance brand strategy? No bass rig should be without this all new bass tube effect! Most noteworthy are newly modernized circuits. For the most part, string bass amps or double bass amps, electric cello amps, even amplified low brass instruments all could have remarkably enhanced tonal characteristics by using a Nitewalker Bass Guitar Tube Preamp in the bass effects chain. Consequently, you may build your own pedal board or use a multi-effects processor with this preamp. In addition you will be creating new tonal factors for whatever type of music you are working on, Rock, Country, Jazz, Classical, Folk – You name it! The 12AX7 tube preamp circuit combines large physically sized paper in oil signal condensers with modern, small physically sized ones. The 12AX7 preamp circuit is a simple Class A type. The secret behind the use of the large physically sized paper in oil condensers is that they have a tendency to reduce transmission of the high freq. components of the amplified signal, said large physically sized capacitors causing certain substantial stray capacities to go to ground. Generally speaking, the higher the voltage rating is, the larger in physical size of the paper in oil capacitor. Hence, the low frequency tone suddenly has the ability to come to life if the circuit uses a 500-630VDC paper in oil capacitor. 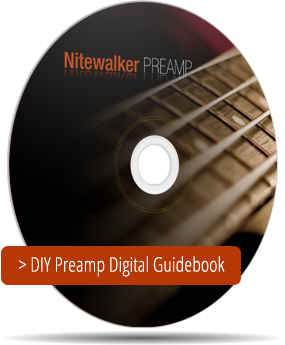 Digital or COSM effects when used combined with the completely analog Nitewalker Preamp are a great addition! Furthermore, it’s here – a bargain at twice the price – The Nightwalker Bass Guitar Tube Preamp! For those on a budget with some extra time buy the DIY Beachcombers Guide to Bass Guitar Tube Preamp Building ebook – ONLY $14.95!!! 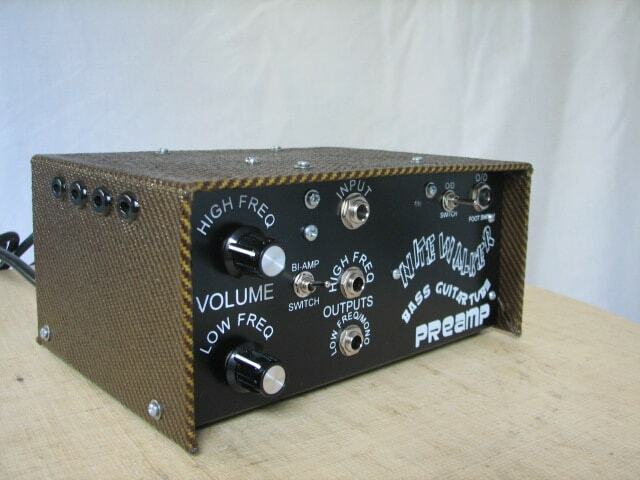 Nitewalker Bass Guitar Tube Preamp shown with optional tweed cover (dark or light). Bruce Gertz, Professor at Berklee College of Music, Bassist, Composer, Author. “The missing link has been found in my bass sound. My Upright basses shine with Great Clarity, and my 5 String Electric Basses sparkle with Great Warmth. If you want a unique addition to your bass guitar set-up go for the very best. It’s a worthy expense for any bass guitar player, because in terms of bass amp effects and bass guitar effects, there is nothing that compares to this unique and simple to use device. One would, of course need to follow normal upkeep practice to remain sounding good. This would entail changing strings, keeping pots clean in the amp and bass, connector and cable awareness, checking speakers and renewing the speaker mounting plywood once in a while, (We suggest a good tone wood, like Baltic birch. ), and checking tubes. Unfortunately, there are products from other manufacturers where the tonal characteristics will not be enhanced to the same degree as others. Visit here for a partial list of compatible products. We at Newbasstone, Inc. pride ourselves on helping you from start to finish. We’re a small, able company offering unique angles for those with musical tastes. If you like playing loud music with the highest of quality, you can’t do any better than our bass preamps. You will suffer no buyer remorse with this product. What it comes down to is the individual musician who plays a bass instrument in a group must recognize the value of improving the quality and color of the individual sound produced, because it will enhance overall group sounds. In conclusion, use of this high quality bass guitar effect will, it seems, be satisfying. Improving the variety of available sonic colorings will be made easier and more accessible. As a result, it’s a sure bet that your audience will be happier and more entertained.